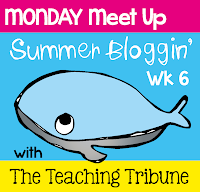 This week... the last week in the series of summer linkies with Teaching Tribune, we are getting to know each other a bit better. Some of the questions were easy...and some were hard. My daughter is still feeding me names that I should be. We are down to Amaya and Avery. I still like Violet after my grandma...who was also my best friend. Thanks Teaching Tribune for getting us all together! 1. I loved playing school, but a close second was catching tadpoles in the pond or Barbies and Dawn dolls. Still have them. Anyone have a Cher doll...have her, too. 2. Fun trying to think of names. I kind of am okay with Renee, but boy are there some bad ones on the top list. 3. And this was coming from a first grader. This was followed by the little kindergartner who in the garden told me he had to pee. I told everyone to line up to go back into class...letting him go after we walked back in...he walked to the door and peed right on the mat going in. All we could do was walk around it...guess I was glad he peed outside and not in the room. I also recall doing a web search with a student and up popped a wrong picture...I hurled myself in front of the screen. Yikes. 4. I love historical fiction romances. I love Pride and Prejudice and that time period. Would love to meet her...she reminds me of me. 6. I worked in a restaurant for six years putting myself through college. It was a breakfast place and boy they sure did a great job! Loved the German Apple Pancake, but it took over 20 minutes to cook, so I would go for eggs bennie or Crepes with this amazing sauce...orange suzette. Some of these answers date me. Oh, well. Nostalgia is always fun. I am going to get out my Bionic Woman game for a round with my kids. Have a great week!